COLUMBUS, Ohio — CBD oil derived from hemp can be found online and in many Ohio grocery and health stores, but state officials are saying the cannabis compound is illegal in Ohio. 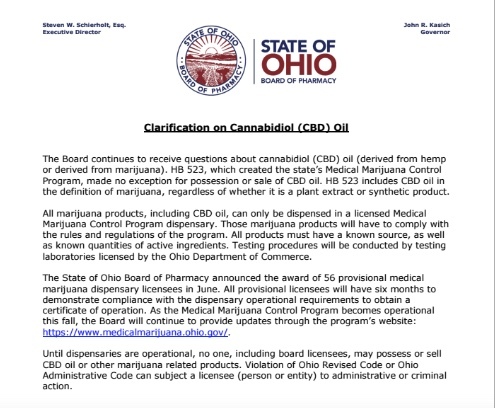 Guidance from the Ohio State Board of Pharmacy issued over the weekend states that CBD oil — derived from hemp or marijuana — can only be dispensed in a state-licensed dispensary. But the first state-approved dispensary is still several months away from opening its doors. All products containing CBD — short for cannabidiol — will have to comply with the rules of the state’s medical marijuana program, including undergoing testing in a state-licensed lab. None of the four labs issued provisional licenses is open for business and likely won’t be until cultivators near their first harvest, which is, again, months away. The pharmacy board’s clarification came after dispensary licensees asked whether they could sell the same CBD products in their stores seen on the shelves at health and grocery stores, board spokeswoman Ali Simon said. The answer: No. Simon cited Ohio law defining marijuana as most parts of the plant including resin from cannabis stalks and fiber. That includes CBD derived from industrial hemp, which is defined in the federal Farm Act of 2014 as containing 0.3 percent or less THC, a psychoactive component of the plant. CBD does not produce a high, and consumers say it alleviates inflammation, depression and a host of other ails. Simon said the clarification went out to all Ohio pharmacists and licensed prescribers including hospitals, as well as law enforcement and the board’s field agents. Simon later clarified that the position was shared with field agents to share with local officials and a field guide for law enforcement is being drafted but has not yet been released. The pharmacy board issued 56 provisional pharmacy licenses in June. Licensees have six months to build out their facilities and meet all obligations in state law and rules. Ohio’s medical marijuana law allows individuals with one of 21 medical conditions to buy and use marijuana and marijuana products if recommended to them by a certified Ohio physician. Two years after the law took effect, Ohio is still trying to get its program off the ground, and the first medical marijuana might not be available until early 2019. CBD-infused oils, soaps, sodas and more have been sold in Ohio under the guise of the 2014 Farm Bill, which allowed state hemp pilot programs that involved research. Ohio has not participated in the pilot program. In December 2016, the Drug Enforcement Administration clarified that CBD and other substances derived from cannabis were a Schedule I substance like marijuana and therefore illegal. The 9th Circuit Court of Appeals dismissed a hemp industry lawsuit challenging the change because the businesses lacked standing. But the court also opined that the Farm Act trumped the DEA change. Martin Lee, director of education and advocacy organization Project CBD, said CBD products should be tested but also should be readily available. Lee said products sold over the counter at grocery stores and gas stations are a mixed bag because they’re not regulated. Simon said she was not aware of any arrests or product seizures as a result of the guidance. In February, two Lancaster businesses were asked to stop selling CBD products and police confiscated their inventory. Law enforcement in Indiana raided several establishments selling CBD in 2017. The state’s attorney general issued an opinion that CBD was illegal. State lawmakers worked quickly to legalize use and sale of non-FDA approved CBD earlier this year. Nycole Brownfield, a mother of an epilepsy patient and advocate from Twinsburg, said many Ohioans have found good CBD products that help them. Brownfield said they too will have to wait until Ohio’s dispensaries open at a yet-to-be-determined date. “Anybody who has anxiety or post-traumatic stress disorder, especially veterans, will suffer,” Brownfield said. This story was updated Aug. 31 to include a clarification about the board’s guidance to law enforcement.